In this new corner of my blog, I introduce to you – Judg(ing) A Book By Its Cover! It’s inspired by Pure Imagination Blog and Stacked By Books. Let’s be honest, covers are the first thing that attracts any of us, the readers, to a book. Before knowing the synopsis of a book, the cover design makes or breaks a book. If I don’t like a cover design, I won’t pick it up. Cover designs can represent the characters/themes/plots of a book or it has nothing to do with the actual book. It can simple or complex or it can feature a popular trend (like a close-up of an eye, or a girl in a dress). Whatever the changes with cover design, I will discuss it. 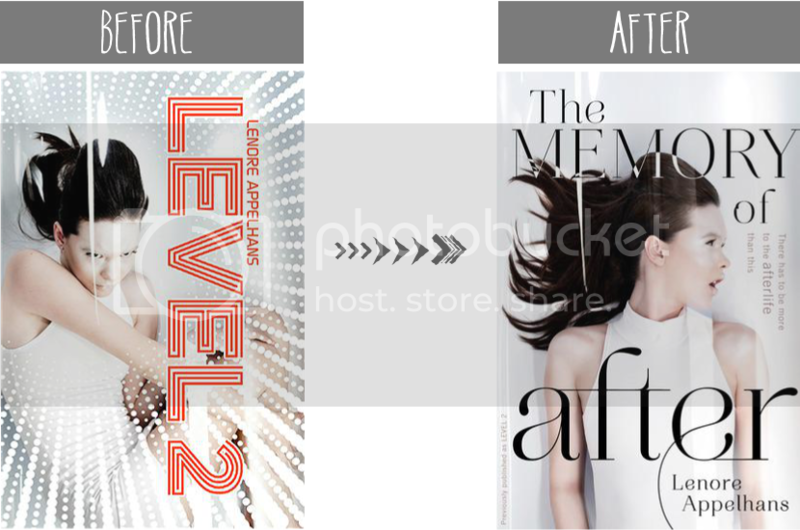 The inaugural post is the case of Level 2 aka The Memory of After. The paperback version of Lenore Appelhans’ Level 2 goes through two changes – its name and its cover. I understand why the title of this book had to be changed. Level 2 is a confusing title. It might make sense once you read the book and understand the reference, but for people who haven’t read it and happened to glance at the book, it sounds like it’s the second book of a series when it is actually the first. (I know I made that mistake when I saw the book.) The Memory of After is a slightly better title for marketing, but I don’t know if I actually like it. And its cover. I’m a little apprehensive about both covers in general because the main character is supposed to be bald (all the drones are said to be bald in the book) and that is clearly not depicted in the two covers. (I guess having a bald figure on the cover won’t sell the book.) I’m not a big fan of book covers featuring a person on it because it’s rarely done correctly (in a way that refers to the book) and it’s usually a girl all dressed up (when the description of the girl is the opposite). If I had to pick which cover I like better, I’d say the first one with elements from the new cover. Why? Well, the girl in the first cover looks like she’s ready to fight with her arms striking out. She seems active, whereas the new cover shows the girl being passive; she’s lying down, exhaling. I like to see the person actually doing something. Also, I like the first cover because of the colors. Okay, yes, both covers are white, which really fits with the world in Level 2/The Memory of After (since I do imagine it as being white and bleak). Futuristic? Check. But with the first cover, I like how the orange color of the typeface pops out, making it not completely stark white. The new cover makes me think of the fashion ads in magazines, advertising a new perfume. Not sure if that’s a good thing or bad, but points for being clean and sleek. What did you think of the name and cover design changes? Do you like it? How would you change it if you could?